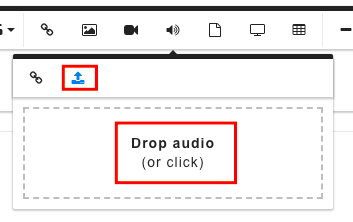 Navigate to the Upload image button from the audio pop-up then click Drop audio (or click). This will allow you to browse your device for an audio file. Once you've found your file click OK. This uploads the file to the Coassemble servers. Now choose how you'd like your audio file to be be aligned. You can choose from centre, left, right, or none. You are also able to set your audio to autoplay using the button pictured below.